PHILADELPHIA (AP) -- The Bruins got started right away with a goal in the first minute and cruised to an easy win after burying the Flyers with a flurry of early goals. PHILADELPHIA (AP) — The Bruins got started right away with a goal in the first minute and cruised to an easy win after burying the Flyers with a flurry of early goals. Benoit Pouliot, Daniel Paille, Zdeno Chara and Milan Lucic scored in the first period to help Boston beat Philadelphia 6-0 Saturday, snapping the Flyers’ seven-game winning streak. The Bruins, who have won four straight tied Philadelphia atop the NHL’s Eastern Conference with 43 points apiece. Nathan Horton and Tyler Seguin added late goals to finish the scoring for Boston, which now leads the NHL with 21 victories. The Bruins’ first two goals came so quickly, Flyers coach Peter Laviolette called timeout after Paille’s goal 2:50 into the game. That came on the heels of Pouliot’s, which was 27 seconds after the opening faceoff. Whatever benefits the timeout had, they were short-lived. Zdeno Chara blasted a shot through Ilya Bryzgalov’s legs about five minutes later, on a power play set up when Philadelphia was called for too many men on the ice. As if that weren’t enough, Lucic scored on a two-man advantage with 2:50 left in the period. With 48.7 seconds left in the first period, things got tense when Flyers’ rookie Sean Couturier was hit behind his left ear off a shot by teammate Kimmo Timonen. After being down for several minutes, Couturier needed help to leave the ice and did not return to the game due to a head injury. The Flyers have already lost veteran defenseman Chris Pronger for the season with a concussion and star winger Claude Giroux is out indefinitely with a concussion. Couturier was taken to University of Pennsylvania Hospital for observations and will not travel with the Flyers during their trip to Colorado. When Horton tipped home another rebound 7:06 into the second period, Laviolette yanked Bryzgalov in favor of Sergei Bobrovsky. Bryzgalov had surrendered five goals on 20 shots. In building a 5-0 lead, the Bruins were 3-for-5 on the power play. 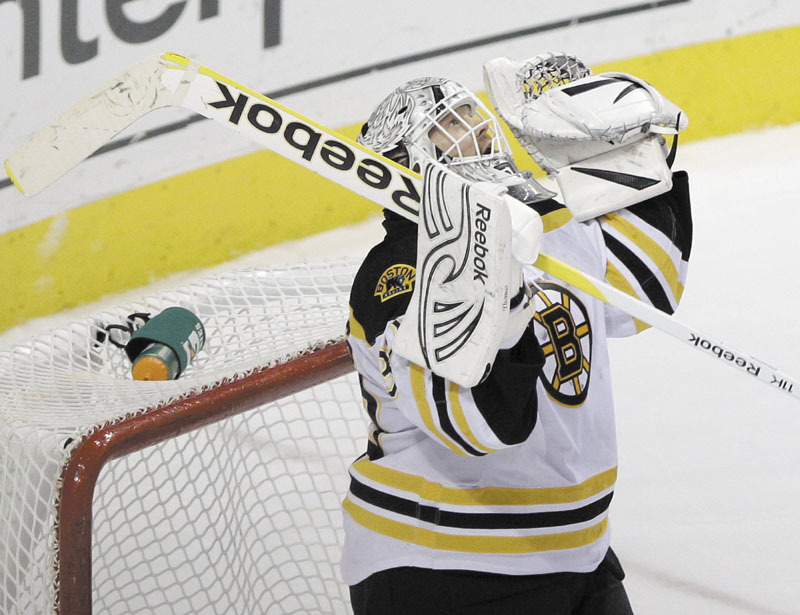 Boston goalie Tim Thomas stopped 31 shots. NOTES: The loss was the Flyers’ most lopsided shutout loss at home since a 6-0 loss to Tampa Bay on Jan. 28, 2006 and worst loss since 7-0 defeat at the New York Rangers on March 6, 2011. … It was the first time the Flyers were shut out at home this season. Philadelphia won’t return home again until Jan. 3, when they play the New York Rangers at Citizens Bank Park in the Winter Classic. … Boston evened the season series with Philadelphia at 1-1 after the Bruins lost their opener 2-1 to the Flyers. … During Boston’s current 8-2 run, the Bruins have outscored their opponents 37-16, including three shutouts.